Vanessa VanDyke’s school at first did not offer a remark ,but now that it is later on in the week, they have said plenty. The school officials are saying that they are not asking her to cut, or put any product in her hair, but they are not accepting her hair as it is. They also retracted that Vanessa would be expelled. My question to you all is, is that enough? Is it enough to say you don’t have to cut your hair and you don’t have to perm it? However, the unspoken understanding is, that your Afro is still unacceptable. What message is society sending to our youth, if when they are comfortable in their own skin, it is somehow conveyed to them that they need to conform. Vanessa’s hair did not pose a problem until Vanessa’s mother brought to school officials’ attention that she was being picked on. School officials are saying that Vanessa’s hair is a distraction. My suggestion is to let it distract them! It is 2013 going on 2014! 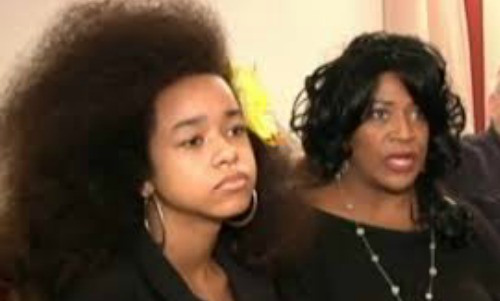 If an African-American female can’t comb her hair and walk out the door like countless others, what world are we living in? Who says that my Afro is unprofessional! Please point me in their direction! Once you point them out, I will introduce to you a brain-washed American! We have been tricked into believing that as a minority, that we need to strip away all of our ethnicity in order to fit into the corporate world. Bullies posed as school officials are just waiting to tell us why being comfortable with ourselves is wrong. When will it be right? Next year? Or maybe the year after that?! I say that there is nothing wrong with it now! Oh yes, let’s sacrifice this girl’s computability with her self, and replace it with insecurity and self-hate and call it the code of conduct! This Post was posted in inspiration and tagged #blackgirlmagic, #twistouts, #twists, big hair, healthy hair, natural hair. Bookmark the permalink.